Before I decided to bake a nut cake for a spontaneous family meeting last saturday I planned to bake poppy seed pastry later the same day. I already mixed my sweet starter for the dough. But seeing my sisters family and my parents were more important and so I placed the well risen starter in the fridge instead. The next morning I checked the starter and it smelled and tasted terrific with a complex but mild flavour. And so I decided that I would use it as I would use a Pâte Fermentée. 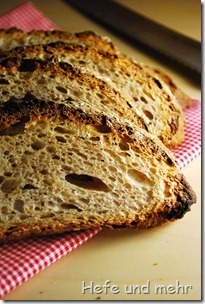 It added a good flavour to the dough, and together with some yeast it helps to give the dough a good oven spring. 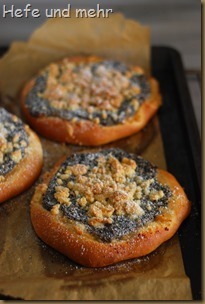 And with a soft poppy seed filling and some applesauce and crunchy streusel it is a delicious Sunday afternoon treat. 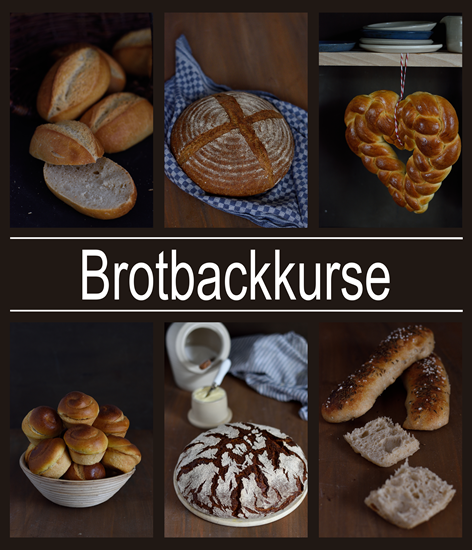 And here is already the second recipe for freshly baked breakfast rolls. They need – similar to the last recipe – only a short time in the morning until they are ready to bake, but need a little bit more attention the evening before when the dough is prepared. The apple has to be peeled and cut, the soaker has to be made and the nuts hast to be roasted and cut. But the rolls are worth the effort! They are slightly sweet due to honey and apple with the deep flavour of roasted nuts and hazelnut oil, combined with the complex flavour of the long, slow rise over night. That I soaked the apple pieces together with the rolled oats in boiling water was done by purpose. The apple I use is from an old variety (presumably Jakob Lebel) and turn brownish as soon as you cut them. This change in colour is due to the reaction of an Enzyme in the cells which are demaged by cutting the fruit. To scald the apples with boiling water denatures the enzymes and turns them inactive, so the apple pieces will not turn brown. My birthday last friday was the last real summer day with 32°C. Already one day later the temperature dropped to 20°C and it started to rain heavily. Hello Autumn! And so it was easy to decide for a cake for the birthday get together with the family. I baked the first apple cake of this season, a cake which is called Riemchenkuchen or Rhineland Applecake. 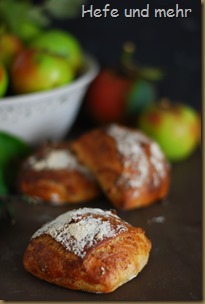 It is a childhood favourite, a yeast dough cake filled with apple sauce. Since some days I was thinking about using a mixture of yeast dough and short pastry as a cake base. This combined the advantage of both doughs: a fluffy dough that stays fresh for a long time and which is very easy to handle. 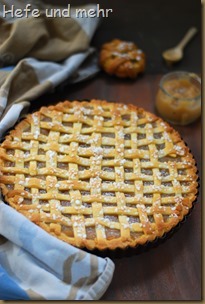 It is very easy to prepare this yeasted shortcrust pastry. You have to make a shortcrust pastry and yeasted dough and combine both doughs after the yeast dough has risen. 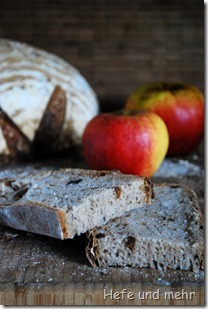 When Martin presented his Windfall Bread with grated apples I knew that this is a recipe I had to test. And when I looked in the basket with windfall from my parents garden I saw some quinces which looked like they had to be used up quickly. And so I but some grated quinces in the in the bread dough, too. 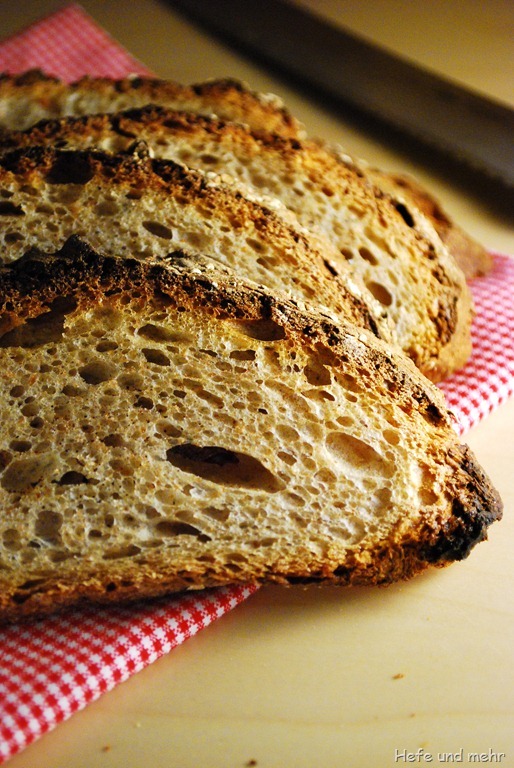 The bread is really great with a moist and soft crumb and a hint of sweetness due to the fruits. In the morning the mist is already lingering in the valley I am living in, the air is getting colder and some windy and rainy days made it clear: Autumn is finally here. And so the first windfall from my parents garden is waiting in my kitchen to be used in some delicious recipes. But what should I do with them? 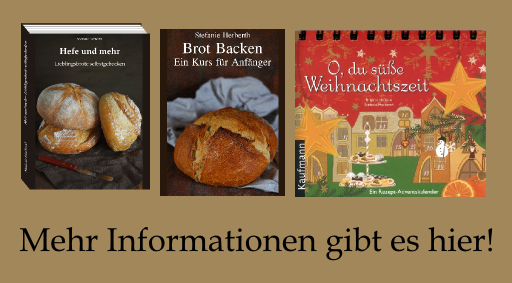 Appel strudel, Apple cake or Apfelküchle are all good recipes, but I was longing for something else. Something with yeast. Something like Cinnamon-rolls? 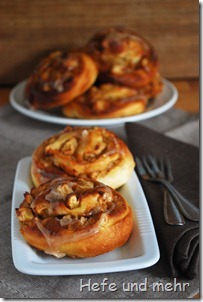 And so I started a yeast dough and bake some Apple-Cinnamon-Rolls. They are filled with a cream made of egg, butter, almonds and cookie crumbles, which I topped with finely chopped apples. Cinnamon is the main flavour in the seasoning, but a touch of allspice and cardamom add a little bit of deepness it. A gorgeous treat, perfect for the early autumn! Autumn means for me nuts, especially hazelnuts and walnuts. But I bake already a Potato bread with walnuts, Apple-Hazelnut Bread and Pain aux Levain aux grains mélangés e noisettes. And before everyone (including myself) get bored with so much breads with nuts I decided to bake a bread with cider for BreadBakingDay because Apples are strongly connected with autumn for me, too. The recipe I created included a small portion rye, just enough for some nice taste but not enough to challenge my stomach. I used some rolled oats and whole wheat flour, together with grounded caraway seeds which gave the bread a very nice taste. And spiced bread belongs to autumn/winter for me, too. I liked the bread very much, especially with a hearty cheese and homemade mustard. MC had the good idea to bake a local bread that contains ingredients which are an expression of the surrounding area. In my opinion this is a beautiful idea and especially in autumn there are a lot of local things that one could put in a bread to catch the essence of “Home”. 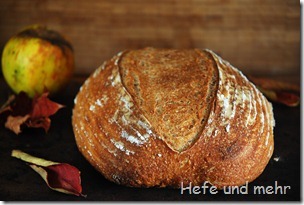 I changed her recipe so it resembles my home: A rustic country loaf, with the apple juice made from windfall fruits(Streuobstwiesen with apple trees are very typical here), hazelnuts and summer flower honey from a local bee keeper. In Germany we had a lot of sun at the end of September to balance the wet and cold summer. The last warm days made the apples on my parents apple tree delicious sweet. But with the begin of October the weather changed to “real” autumn with 10°C as highest temperature, rain and storm. 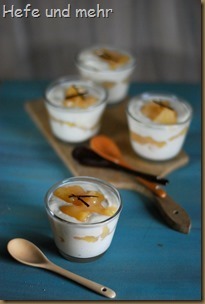 I was longing for something sweet and warm for dessert to warm me from inside. 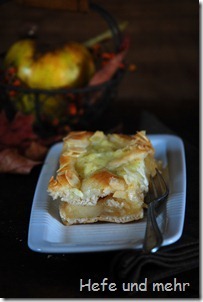 Something sweet made with the delicious hand picked apples. 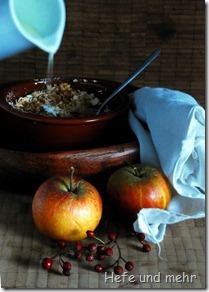 I longed for the sweedish apple casserole topped with thin-rolled oats. A colleague of mine baked it for her birthday last winter – but forget to give the recipe to me until now. And so I made the crust like I thought it would work. And it taste good – who needs a recipe?